In recent years, the event has been much freer from serious trouble and is generally viewed very positively as a dynamic celebration of London's multi-cultural diversity, though dominated by the Caribbean culture in the best traditions of Rio. However, there has been controversy over the public safety aspects of holding such a well-attended event in narrow streets in a small area of London. Concerns about the size of the event resulted in London's Mayor, Ken Livingstone, setting up a Carnival Review Group to look into "formulating guidelines to safeguard the future of the Carnival". An interim report by the review resulted in a change to the route in 2002. 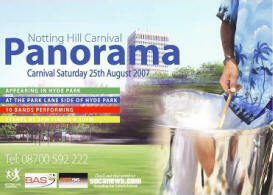 When the full report was published in 2004, it was recommended that Hyde Park be used as a "savannah"; though this move has attracted some concern that the Hyde Park event may overshadow the original street carnival. 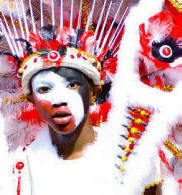 The pre carnival live Calypso Tent takes place for six weeks during July and August. It occurs only at Notting Hill Carnival time and is spread over 6 Friday nights at the Yaa Asantewaa Arts Centre, in Chippenham Mews, just off the Harrow Road, between Chippenham Road and Marylands Road. Dont miss the stars of Calypso music, including Cloak, Wen D, Helena B, Mighty Tiger, Alexander D Great, Clivus, Cleopatra, G String, Admiral Jack, Brown Sugar [2006 Monarch], Peace and Love, & Explorer. 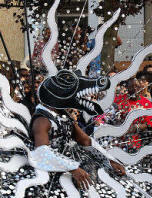 "Carnival arts are a fantastically vibrant artform which bring our streets alive. " The Arts Council continues to support Notting Hill Carnival in 2007 with over £500,000 invested in activities for the 2006/07 cycle. £406,457 has been through our Grants for the arts funding programme, to projects such as The Notting Hill Mas Bands Association, which received £56,513 to support the Grand Carnival Splash at Alexandra Palace on 19 and 20 August, a spectacular event showcasing the best adults' and children's costumes created for Notting Hill. This major Grants for the arts program also investsrevenue funding of £577,824 to 13 carnival organisations in London, with most performing at Notting Hill Carnival. This funding is critical to maintaining the high standards in costume making and designing, choreography and composition. Also supported organisations such as Association of British Calypsonians will be hosting a World Music Stage in Powis Square on both days of the Notting Hill Carnival. "I am very pleased to be backing the carnival again, particularly in the year that we are marking the 200th anniversary of the abolition of slavery in England." The Inaugural Hyde Park 'Carnival in the Park' event will be held to compliment the carnival. There will be a variety of stages and family activities, including the National Panorama Championship 2007 where ten of the UK's top steel bands will compete for the title of National Champions of Steel. For a lot of Trinis and other like minded revelers this means they'll get an opportunity to party Panorama straight through till the sunrise that defines Jouvert morn. "We have a choice? Do we cap carnival in a sense of keeping it within constraints or Do we actually look at the planning for Carnival and decide Let's expand Carnival, in a safe way, and include more people rather than less. "It's focal point is Notting Hill. It is known as the Notting Hill Carnival. It will always be known as the Notting Hill Carnival although in the future it might take place in different parts of London." "I don't think its any dilution moving to Hyde Park. It's an expansion, a development and a constructive one." Mayor of London's director for equalities and policing and is Chair of a number of committees including those addressing issues concerning policing, faith, cultural diversity and economic justice. Jouvert pronounced ‘Jouvay’ meaning ‘day-break’ procession have evolved from Trinidad Carnival and are very popular people's celebrations at dozens of Caribbean Carnivals throughout the world including the world's 2nd largest which takes place the weekend following Notting Hill Carnival in Brooklyn New York. Jouvert evolved from 19th century Canboulay festivals, these nighttime celebrations saw ex-slaves gather to masquerade, sing and dance in commemoration of their emancipation. They generally allow no amplified music and feature the sweet symphony of steel pan. This is public ritual on a scale rarely seen in the western world. Mayor's slow and steady big tent approach finally carries the day. The steel band competition is moving to Hyde Park and in the future three days of events will be held in Hyde Park. The local authorities whose agenda these last few years was shrinking Carnival through constraints will not be involved in the Hyde Street planning but will continue to issue the Sound System permits. Check out our 2007 events page for the hottest fetes, weeklies, and band launches. Carnival season begins in 2007 with the launch of the London Calypso tent. More at londoncalypsotent.com. Every year, over one million hours go into labour among the 70 plus bands that compete for Best Mas on the Road. join over 100 drummers, brass/woodwind player and dancers for 2 weeks and put together a Carnival show to tour the UK. In a pre-Notting Hill warm-up, Alexandra Palace plays host to the Grand Carnival Costume Splash, presented by the Notting Hill Mas Bands Association - a show and competition of all the flamboyant and glitzy masquerade costumes that will be on parade during the carnival. Prizes are awarded across four age groups for Best King of Carnival, Best Queen of Carnival, Best Male Costume and Best Female Costume. 2007 is an extra special year for the Notting Hill Carnival, as it coincides with the bicentennary of the abolition of the Slave Trade. Aside from a costume parade and competition, Carnival Costume Splash features face painting, mask-making, musical performances and a presentation of new dance moves. Tel: 020 8365 2121. Tube: Wood Green. Playing Live: Verde Vai, with DJ Limao. samba school Verde Vai with an amazing show featuring their incredible bateria and dazzling dancers. Venue: Guanabara, Parker Street, corner of Drury Lane, London WC2B 5BW. Time: 5pm-midnite. Happy hour: 5pm-7pm. Info: 0207 242 8600.
in concert at the Hammersmith Apollo, the show features costumes by Peter Minshall. More infos and tickets VIP SOLD OUT!! 10 Steel Orchestras compete for the title National Champion of Steel, plus guest performers (ABC Brass from Rotterdam, the winners of the 'Battle of Drums' competition at Zomercarnaval 2007). at Little Croft Country Manor in Radlett. Featuring David Rudder and his band, Roger George, The Soca Princess, DJs Tweze and Radio Active's Hoppy live and direct from T&T, DJs Markee and Gladiators Sounds, this and much more. Party on the Streets beginning with early morn Jouvert. Followed by the Children's parades. Static Sound Systems: A list 40-odd of the Static Sound Systems can be found here. Some of the music you can hear includes reggae, dub, ska, techno, house, drum & bass, hip-hop, soca, salsa, dancehall and more. Inaugural Hyde Park 'Carnival in the Park'. Hyde Park, W2. Tube: Marble Arch. Full mas processions on the Streets of Notting Hill On Bank Holiday Monday, the whole area will come alive with the traditional and spectacular procession. Hundreds of brightly decorated floats - pumping out music and packed with partygoers - will parade around the streets in the Ladbroke Grove area. Spectators can also dance along to steel drum players as well as listen to soca, house music, reggae and drum and bass. There'll be plenty of Caribbean snacks such as patties, plantain and jerk chicken to feast on at the hundreds of stalls. 15th July: Birmingham Latin American Festival. A collection of various festivals in August and early September of each year in Edinburgh Scotland. The largest Latin American out-door event in the Europe. Takes place this Sunday in Burgess Park, south London. 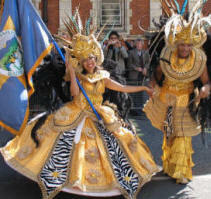 Leeds Carnival 40th anniversary in 2007. The Bi-centenary and the 800th year of Leeds as a city. Come and join us in the commemoration & celebration. 40 years " Not Out "